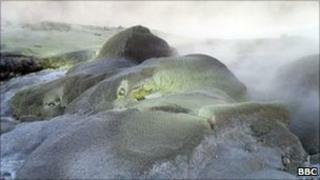 An eight-year old boy has died after falling into a geothermal pool in New Zealand. The boy, who has not been named, fell into a hot water pool at the famous Rotorua site on Sunday. He was flown to hospital in Auckland and placed in intensive care but died on Thursday. Geothermal pools can have temperatures higher than 100 degrees Celsius (212 Fahrenheit). An investigation is under way into how the boy fell in. New Zealand is home to several areas where underground geothermal activity produces steaming ground, bubbling hot pools and dramatic geysers which spurt boiling water and steam into the air. The boy was with his family at the Kuirau Park in the tourist area of Rotorua on 26 December when the incident took place. A witness, Anna Kare, told the New Zealand Herald newspaper that she saw a teenager carry the boy to his parents. "The boy was yelling 'my hands, my hands,' and I saw all the skin on his hands peeling off," Ms Kare said. "I saw the burns were all the way from his head to his feet." She said it was unclear what had happened but she did not see any mud on him so assumed the boy had fallen into a hot water pool. The boy is understood to be from a Pacific island and was in New Zealand on holiday with his family. Rotorua District Council has checked safety fences and warning signs at Kuirau Park and has asked for more witnesses to come forward. All pools in the park were fenced off and carried warning signs, officials said.